The Caribbean islands are the epitome of tropical island-romance; Exotic rhythms, lush vegetation, palm-lined sandy beaches, friendly people and the endless turquoise sea. No caribbean island is like the other, each has something special to offer, has its very special sights and natural beauty. 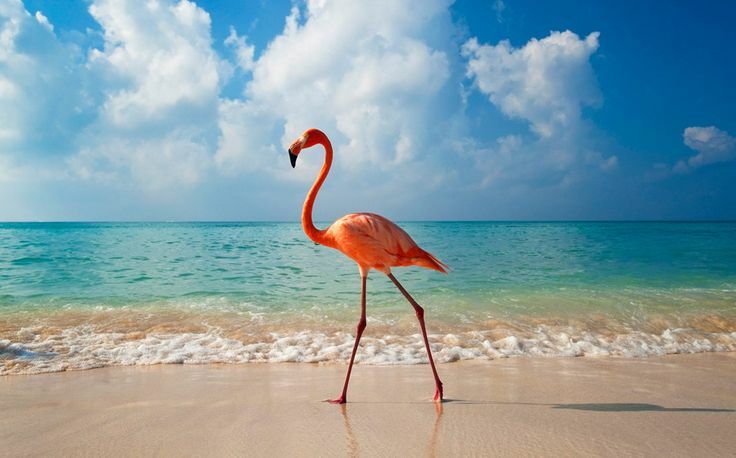 And as colorful as the nature of the Caribbean is the population there. Paradizo has been offering luxury villas in the Caribbean for many years, and therefore we thought to give you some insights about the beautiful Islands. The island known as the “High Society Meeting Point” spoils you with luxurious hotels and gourmet restaurants. Nevertheless, there is a cozy atmosphere on St. Barths, where you can feel comfortable and relax. With more than 300 days of sunshine a year, dramatic mountains and beaches, St.Barths is one of the oldest volcanic islands in the Antilles and a true Caribbean paradise. Hummingbirds flutter in the garden and turtles accompany you snorkeling. No wonder that it is one of the top holiday destinations for the rich and famous. The life takes place mainly on the beaches here. Long, bright white sand surfaces invite you to enjoy one of the many sunny days. On the 22 snow-white beaches, families with small children will find perfect bathing fun due to gentle wave breaking. During the period from June to August one can observe rare sea turtles laying eggs. Water sports fans have endless possibilities here: from snorkeling and diving to kitesurfing and sailing. The countless sailing boats, which lie in front of St. Bart’s coast in the turquoise waters, offer a beautiful picture. Just a short walk from the capital, Gustavia, which is famous for tax free shopping pleasure and where countless events are taking place on the weekends, Shell Beach is one of the nicest beaches on the island. The water here is wonderful clear and warm, the ambience invites you to relax. Marigot Beach is the place to go if you are looking for a perfect place to snorkel. The worldwide famous Virgin Islands, in the Caribbean belong to the Lesser Antilles, but they are politically divided into the British Virgin Islands and the American Virgin Islands. Part of this Caribbean island belongs to Puerto Rico. The three largest islands, the only one permanently inhabited, are St. John, St. Thomas and St.Croix. But it doesn’t matter to which of the islands you will travel to, everywhere you will find amazing dive sites and palm-lined dream beaches. The climate in the Virgin Islands is tropical and mild throughout the year. The highest temperatures are between 29 ° C and 31 ° C. The lowest rainfall is from February to May, so this period can be described as the best travel time for a relaxing beach holiday. Imagine over 50 stunning islands ,most of them are completely unaffected, uninhabited and paradise on earth. Others convince with charming villages or bars. Enjoy the gentle breeze by the sea, beaches of fine white sand and coral reefs with sunken ships that invite you to fascinating dives. For activists and adventurers, cultural friends, gourmets or families, the virgin islands are the place to visit for everyone. Go diving, fishing or surfing after relaxing on the wonderful beaches in the shade of a palm tree and sipping a cocktail. The main attraction is nature itself. Most of the islands are of volcanic origin. The virgin islands, especially Anegada. Is also famous for sailing. To the south of this island you will find three bays for anchoring: Little Harbor, Great Harbor and White Bay. On the wooded island of Tortola, numerous hiking trails have been set up. Culebra island is famous for its Flamenco Beach that has been recognized as one of the most beautiful beaches in the world, with an old shipwreck lying on it. The Dominican Republic is an island state located on the island of Hispaniola east of Haiti, between the Atlantic and the Caribbean. The country offers a variety of natural beauty, which is almost unique in the Caribbean: luxuriant subtropical vegetation, mountain ranges with over 3000 m peaks and, of course, the famous white sandy beaches with turquoise water. The official language here is Spanish. On the north coast there is a tropical climate with high humidity; Even in winter the temperatures never drop below 21 ° C. The average air temperature is 28 ° C. If you are in the north of the island, you will be astonished at the sight of the beaches of the Samaná peninsula, Las Galeras, Las Terrenas and Playa Rincón which meet all the clichés of beautiful Caribbean paradise beaches: powdered white, fine sand and surrounded by tall palm trees. At least as popular as the Playa Dorada with its three kilometers stunning long beach. 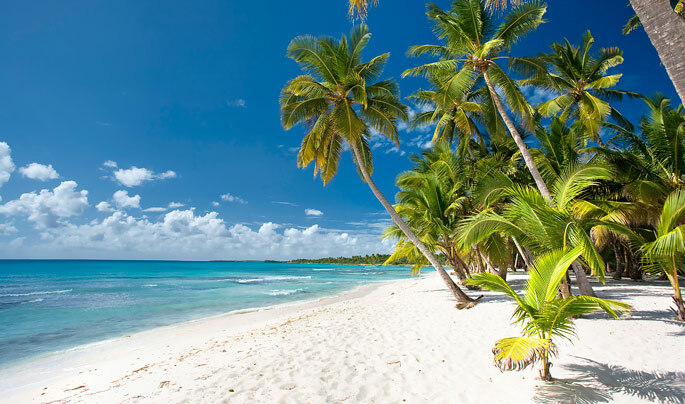 If you visit the south of the Domenican Republic, a must see are the beaches of La Romana, Sona and Boca Chica. From water sports such as diving, surfing and water kiting to horse riding on land, everything is possible here. Also very popular here is the beach party at Boca Chica beach. The perfect combination of nature and luxury awaits you on the north-east coast of the Dom Rep. Near natural beaches and virgin forests together with stunning mountains which make the heart of every nature lover on the Samana peninsula beat faster. A special highlight in February are the humpback whales, which find their way to the bay and raise their newborns here. The dream island Barbados belongs to the small Antilles in the Atlantic, relatively close to the Caribbean islands. Barbados is a British island and the official language spoken here therefore is English. The island is about 35 kilometers long and 30 kilometers wide. If Barbados is considered the epitome of the Caribbean flair, it is mainly due to its dreamlike, palm-lined beaches, the crystal-clear water and the fiery rum that was once invented here. Barbados has preserved its natural beauty and combines splendid beaches and British charm to one of the most popular resorts in the Caribbean. The west coast of the island offers over 16 km of perfect, white and slightly pink sandy beaches with perfectly clear water. No matter how this idyllic beach is still called – the most appropriate name for this piece of paradise is “platin coast”. A specialty here are certainly the English mansions and the numerous sugarcane plants scattered all over the island. Bridgetown, the capital of Barbados is located south and is a bustling capital, an architectural mix of shops and restaurants, made up of modern and Victorian colonial buildings, offering some sights. Broad Street is home to the best shops in the city.Barbados has a pleasant, mild, tropical climate. Constantly blowing trade winds bring a pleasant cooling. It is sunnier and drier than any of the other Caribbean islands. There is a simple reason why Barbados has become one of the most popular destinations in the Caribbean: its fantastic beaches and a tourism industry with remarkable professionalism serving the caribbean spaces of its guests. The South Coast meets its reputation as a culinary meeting point and epicenter of Caribbean entertainment with Caribbean ease. This luxury 5-bedroom villa provides enough space for up to 10 people and is located in Petite Saline within minutes of several beaches and shopping. This renovated villa offers expansive views of the sea and coastline. The living room has comfortable seating and opens to a terrace with outdoor sitting and dining areas. Welcome to the beauty, serenity and peaceful elegance of Casa Bella Villa. This Dominican Republic luxury vacation villa rental offers 3 bedrooms, all en suite and air conditioned, located right on the beachfront in the exclusive gated community of Orchid Bay Estates. Sweet Enough is a beautifully appointed five-bedroom house located within the exclusive Sugar Hill Resort Community with panoramic views of the Caribbean Sea. All of the bedrooms are fully air-conditiioned with bathrooms en suite.